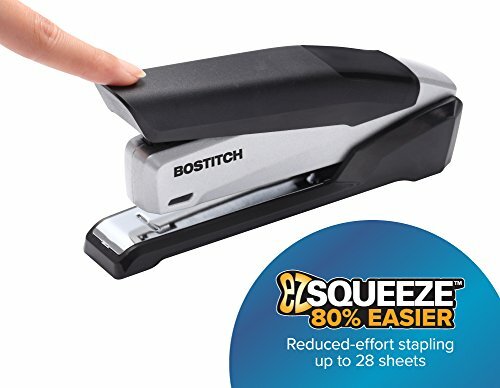 Effortless performance from a stapler that’s 80% easier to use: use just one finger to staple up to 28 Sheets of paper. Designed for convenience, it features a built-in staple remover for quick fixes and a hidden staple storage compartment to keep extra staples handy. Jam-free operation allows for smooth stapling of up to 28 Sheets. The durable die-cast metal housing with soft grip and base, ensures comfortable, lasting use. Opens for bulletin board tacking and crafting. Stands vertically or horizontally for easier access and storage. USES premium standard staples. Perfect for school, work, or the home office.